Well, the weather outside is … not exactly frightful, but there is the occasional crispness to the air and that means that Christmas season must be coming soon. In fact, one of the official markers for the beginning of the holiday season will be this Saturday afternoon and evening in downtown Wichita Falls. Of course we’re talking about the big City Lights Parade and Festival! We say parade AND festival because there’s much more going on this Saturday than just the city’s biggest downtown parade of the year. 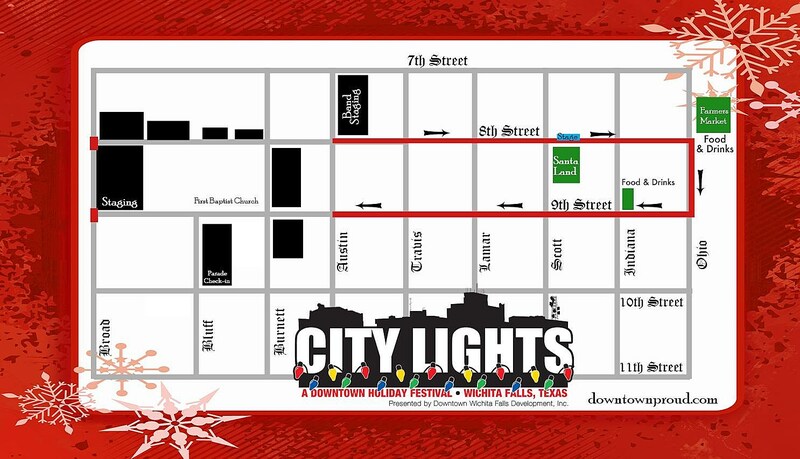 There’s Santa Land at Park Central – that’s the small downtown park area next to Big Blue at the corner of 8th City Lights 5k run kicks off at 6:00, and the parade starts at 7:00. The last we heard there were at least 100 entries in the parade, so it should be a grand spectacle as it makes its way down 8th street from Austin to Ohio, then up 9th street back to Austin. Here's a handy map to help you with your planning. That gives you plenty of places to watch the cavalcade of colors, sounds and flashing lights, but you’d be well advised to stake out a spot near downtown because the food vendors will all be set up close to the Farmer’s Market area and doesn’t some warm, fresh funnel cake sound delicious on a cool autumn evening? We also have it on good authority that Santa Claus himself will be there. This Saturday evening’s City Lights Parade and Festival is hosted by Downtown Wichita Falls Development and is the perfect way to kick off your family’s holiday season.